Music by Thomas Moore. A song from Co. Wicklow Ireland about where two rivers meet ''The Avoca'' and ''The Avonmore'' . Recorded by John McCormack, Maureen Hegarty and Tommy Fleming. The tin whistle sheet music in C Major is included. Ere the[G] bloom of that[C] valley shall[D7] fade from[C] my[D7] heart. Ere the[G] bloom of that[C] valley shall[D7] fade [C] my[G] heart. 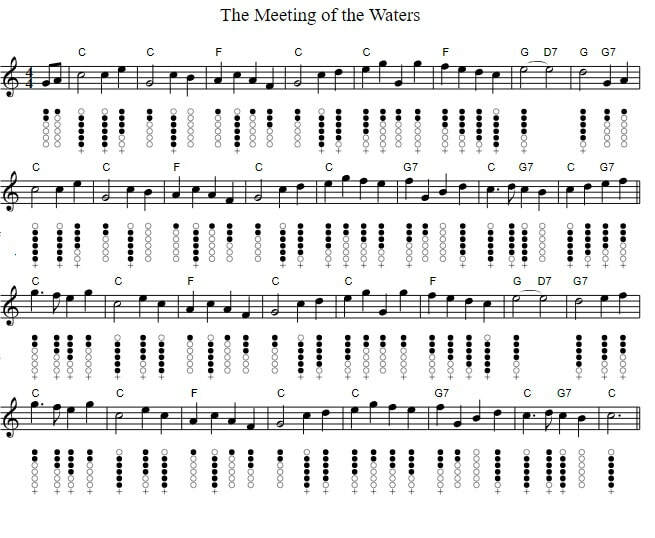 The meeting of the waters tin whistle sheet music notes. This is one of the very few pieces of music on the site that I have set to the key of C for a C whistle.